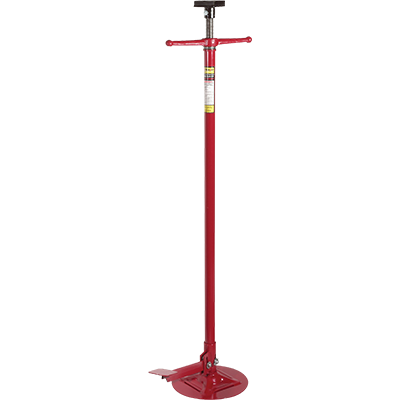 This high reach jack stand features our exclusive "Jiggle Jack" foot pedal and stabilises up to 748 kg. worth of automobile being supported by a car hoist. The RJS-1TF high-reach jack stand is ideal for holding drive-train or exhaust components in position beneath raised vehicles. It’s similar to the RJS-1T high-reach jack stand but features Ranger’s own foot pedal technology that helps place the stand exactly where it needs to be during service. This ultra-rugged foot pedal lets you "jiggle" components for quick alignment (that’s why we call it the Jiggle Jack). Without this feature, it can be tricky to get jack stands placed exactly where they need to be, especially when maneuvering under a car hoist. This revolutionary foot pedal feature lets you stay upright and make all your vertical adjustments by foot, so your hands are free to horizontally position the hoist. The RJS-1TF high-reach jack stand is your perfect in-shop helper for stabilizing a hoisted vehicle. The ACME screw adjusts to heights between ​1,382 mm and 2,045 mm, and the thick rubber on the stabilization pads provides maximum support. High-reach stands are a staple in any shop that performs engine, transmission or exhaust removals on vehicles raised on a two-post hoist. When heavy equipment is removed from cars and trucks, the center of gravity shifts, which results in less-than-perfect balance, or even worse, catastrophic tipping. These stands hold the vehicle in place and prevent damage to you, the car hoist and the vehicle. They’re also a smart solution for reaching tricky undercarriage components with a four-post hoist. Just place the stands between the runways while the vehicle is lifted and lower the runways. The stands will support the vehicle up to their rated capacities. You can always add more stands to increase overall weight capacity.